Temperatures will slowly climb above average through the end of the week. Rain is in the forecast for this weekend. Today and Tonight: Wednesday looks like another good one. Sunshine will fill afternoon skies as thermometers chug upward into the low 80s. Winds will be light and northeasterly. Overnight will again bring clear skies and lows in the middle 50s. Up Next: Thursday will be sunny and a touch warmer with highs ticking just above average in the low 80s. Humidity should not return until at least Friday and even by then, it will not be nearly as sticky as last weekend. The weekend forecast is beginning to look unsettled. Saturday will bring an increase in clouds with at least isolated showers and thunderstorms. Sunday will likely be the more unsettled day—and a forecast to which you should pay attention if you have outdoor plans. An approaching, slow-moving front is expected to bring more widespread showers and thunderstorms. Another cool down is expected early next week, behind the front. The Tropics: Alas, the tropics are all quiet. No development is expected over the next five days. Surface high pressure will settle in the Eastern U.S. Wednesday through the end of the week resulting in easterly and eventually southeasterly winds by Friday. A weak upper level ridge will move across the area Thursday allowing temperatures to spike above average during the afternoon hours. The onshore flow kicking in on Friday will mean dew points begin to climb and some humidity will be felt. While showers will not be possible beyond the coast, some clouds may develop over inland areas. An upper level trough will be digging into the Midwest and then Eastern U.S. Saturday into Sunday. There will be an associated cold front at the surface. The trough is going to be positively tilted meaning that the front will be rather slow to progress unlike its predecessor. Additionally, the positive tilt should keep the threat for severe weather at bay. With the front to the west on Saturday, showers and thunderstorms will be able to develop with some deeper moisture present. A lack of extensive forcing should mean inly isolated activity is possible. 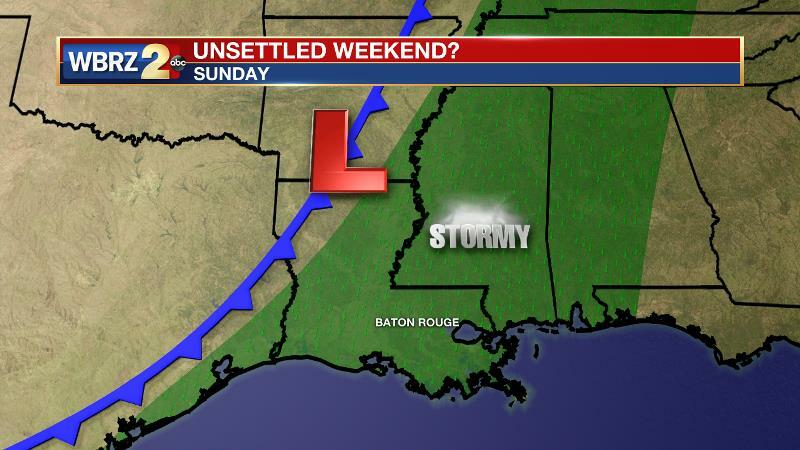 By Sunday, frontal forcing will lead to more widespread unsettled weather. Forecast models are coming into better agreement that the cold front and trough will cross over the area by Monday morning and cooler, drier conditions will follow.